This budget Windsor overlap shed has a surprisingly stylish design. It is also available in a windowless version if you’d prefer a more private space to store your tools and equipment. This model however, features four fixed windows glazed with shatterproof styrene. So not only is it excellent value for money, but it’s also safe too; making it ideal for family gardens. Traditional style overlap is used on the cladding and with regular treatments it benefits from a super 10 year anti rot guarantee. It has even been given a free basecoat treatment at the factory. This isn’t a very strong treatment but it does protect the timber whilst it is working its way to you. There are large, wide double doors which open out to reveal a very generous entry space. These have also been fitted with a button catch to prevent them coming open on their own accord. It doesn’t offer much in terms of security, but this can easily be improved. You’ll find a wide range of shed locks available, as well as alarm systems online. Overall this is one of the largest sheds available and considering its huge spacious design, it comes at an extremely low cost. Although for the price you pay the solid sheet interior is a reliable, good quality construction, it isn’t going to be suitable for heavy storage. So it is recommended you invest in a few strengthening measures such as adding another sheet on top or adding bracing for stability. This is a budget storage shed, built with reliability and affordability in mind. Due to its extremely low cost, it does have a pretty basic design. However, its measurements are impressive compared to a lot of other models. Take its height for example. Reaching up to 6’11” tall, this shed gives you a lot of interior space. Its doors also have a wide opening design, making it possible to transport all kinds of equipment easily. 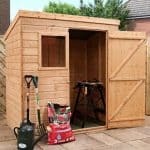 Being one of the largest storage sheds on the market, it is capable of storing all of your garden furniture, equipment and tools. Constructed with solid sheet materials, the roof and floor of this shed provide a reliable, good quality interior. The apex roof is used for its water-resistant benefits, as well as its height boosting benefits. It is covered by a basic mineral felt which is provided free of charge. Now this isn’t the strongest or most durable felt on the market, but for this price range it’s a great addition and provides standard rot protection. Now the solid sheet floor is reliable and sturdy enough if you’re planning on storing light, plastic garden furniture and equipment. However, it isn’t really designed to hold heavy items. So it could be worth taking a few measures to improve the strength of the floor by adding bracing or an additional solid wood sheet. Traditional overlap is used in the creation of this shed. A lot of people don’t realise that there’s actually more than one type of overlap. The traditional square cut version is the highest quality. This has been given a basecoat treatment before it is shipped out to protect the timber from damage whilst it is in transit. What you need to know about overlap cladding is that it does warp more easily than tongue and groove. 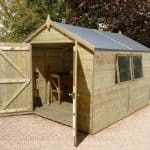 So if possible we’d recommend installing this shed out of direct sunlight. Standard 28mm x 28mm framing is used giving the shed a solid and stable structure. Treatment wise you will need to apply a good quality, preferably spirit based, treatment after assembly. Then annual treatments are required to keep it protected against anything the weather throws at it throughout the year. Do this and you’ll be rewarded with a 10 year anti-rot guarantee. Double doors provide excellent spacious access into this shed, making it easy to get all kinds of equipment in and out of the building. They are hinged in two places, reducing the risk of them sagging over time dramatically. Thanks to the height of the doors you’ll also be able to just walk right in and out comfortably without the risk of banging your head. They are fit with a button catch to keep them shut when required and thanks to their design, a hasp and staple can be easily installed. There are two variations of this shed and this model is the windowed version. It comes with 4 large styrene glazed windows. This is a plastic alternative to glass and is totally shatterproof. They ensure you get a massive amount of light inside the building during the day, making it great for use as a potential workshop as well as a general storage shed. The windows are fixed so you can’t open them, but ventilation can be added to the building if you leave the doors open whilst you’re home on hot sunny days. Another benefit of the windows is that they can be installed on the right or left hand side of the shed. 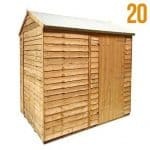 As this is a low budget shed, it doesn’t offer much security. However, the fact that the windows are fixed rather than openable does add a little more protection. Thieves won’t be able to open them and climb in. If you need to store anything expensive in the shed however, we’d recommend installing a hasp and staple followed by a padlock. Privacy also isn’t something you benefit from with this building. The overlap isn’t supportive enough to handle the weight of curtains or blinds so it isn’t something that you can really improve either. 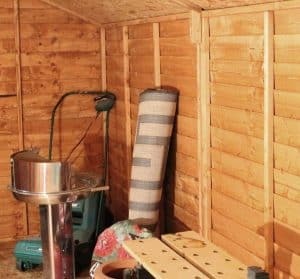 However, as the windows can be placed on any side of the shed, it does allow you to place them so they are facing the more private side of the garden. This shed doesn’t come with a huge range of extras and customisation options. However, you are given a great choice of coloured treatments. Some merchants supply a free treatment with the shed so this can save you money on the first year’s maintenance. It is still worth taking a look at the other colours on offer though. There are four in total ranging from a unique Cedar Red to a more sophisticated Dark Brown. They are 100% environmentally safe and very easy to apply. The DIY Assembly Assistance Tool Kit isn’t the most useful extra, but it really depends on how much DIY you have carried out. If you’re a DIY enthusiast then it’s safe to assume you won’t need most of the tools included in the kit. However, if you don’t tend to do a lot of DIY tasks then this kit will provide you with everything you need to self-assemble this model. Note that this kit is sold on the manufacturer site and may not be available at different retailers. Extras do vary depending upon where you buy the shed. 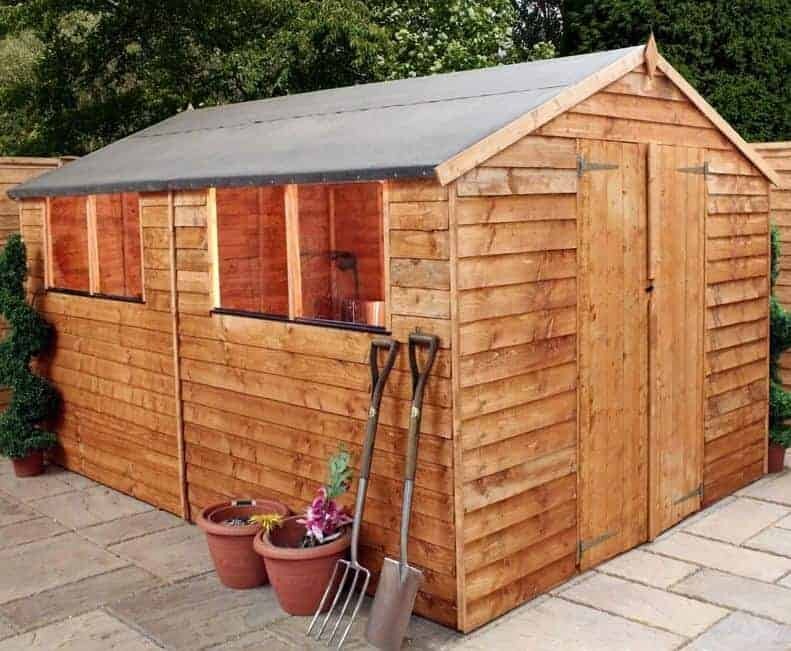 We are pleasantly surprised by the quality of this shed. It is made from the highest quality traditional overlap and offers a more stylish design than many of its competitors. As overlap is generally weaker than tongue and groove, you’d expect it not to last as long. 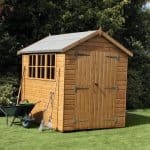 However, if you treat it with a high quality preservative, this shed comes with a 10 year guarantee. This means it lasts just as long as tongue and groove models. You just need to be careful about where you place it as too much harsh sunlight can cause the timber to warp. This is one of the most spacious storage sheds available and allows you to keep all kinds of items in here. Everything from lawnmowers to fishing equipment and machinery can be added provided you take measures to strengthen the floor. 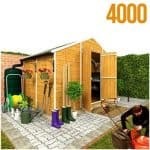 Customers have stated that the installation of this shed is straightforward thanks to the clear instructions provided. The only disadvantage is the length of time it will take. This is obviously a large shed so it will take quite a long time to build. 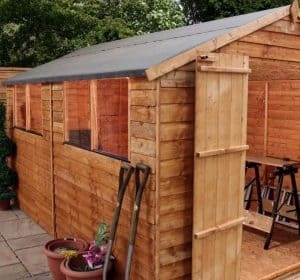 This shed comes at an amazingly low price. It is specifically built with budget in mind, yet it also benefits from surprisingly good quality. 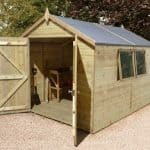 If you’re looking for a budget shed that’s built to last, this is an excellent model to opt for. Final Thoughts: This is by far one of the best value large storage sheds on the market. Offered at an extremely competitive price, the shed comes with a range of great features. The traditional overlap used offers a more stylish look than many other overlap sheds. It also benefits from very large double doors to ensure you have a brilliant amount of access to your storage. There are 4 fixed styrene glazed windows added to this model which ensures a lot of natural light gets into the shed. As long as annual treatments are added, it comes with a 10 year anti-rot warranty for reassurance too.